Every hundred bizarre creatures I chuck in a very colorful creature as a celebration. 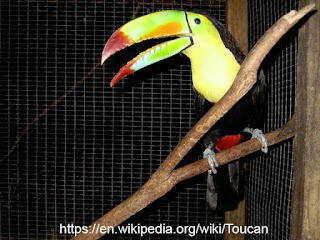 This time I have chosen the bird family Ramphastidae, commonly known as the toucans. Those beaks are not only useful for picking fruit but they are also used to regulate their body temperature. In some species the beaks are sexually dimorphic which probably means they have a role in selection. Although these friendly looking birds eat mostly fruit, they are not above a little hunting. They often eat insects or small vertebrates, including eggs or chicks of smaller birds. Toucans are found in the American tropics.